On the heels of the recent #1 debut of his new studio album LOVE AND WAR in the U.S., Australia, Canada and U.K, superstar Brad Paisley is heading back to school. 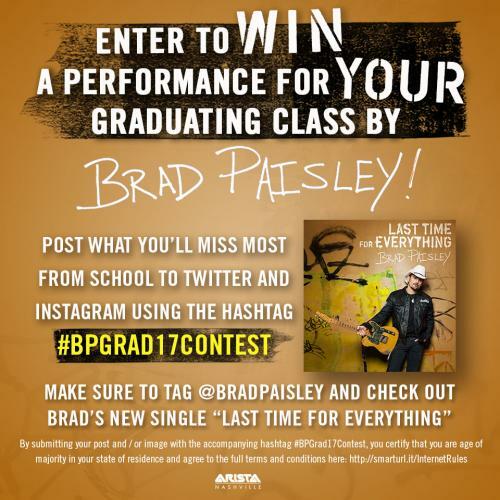 Paisley announced today his “Class of 2017 ‘Last Time for Everything’ Contest” which will culminate with one fan winning a Brad Paisley performance for their graduation class. Now through May 25, 11:59 pm Eastern Time, fans may submit posts on either INSTAGRAM or TWITTER using the hashtag #BPGrad17Contest with their answers to the question: What “Last Time” are you going to miss most about school? Those interested in submitting posts may draw inspiration from the lyrics of “Last Time for Everything,” Paisley’s current hit at country radio. Multiple contest posts are allowed, and contest rules are available HERE. Paisley’s 9th consecutive studio album to debut at #1, LOVE AND WAR was co-produced by Luke Wooten and Paisley on 13 tracks, with Timbaland and Luke Wooten producing “Grey Goose Chase” and “Solar Power Girl" and John Carter Cash and Luke Wooten producing “Gold All Over the Ground.” Kendal Marcy was executive producer for the studio album. Download and stream the studio album LOVE AND WAR HERE and HERE. Also available now is Brad Paisley’s visual album LOVE AND WAR which can be streamed for a limited time exclusively on Apple Music HERE. Directors involved with the first-ever country visual album were Paisley, Dave Brown, Derek Cressman, Frank Agnone, Jeff Venable, Jim Shea and Todd Cassetty. Producers included Ben Skipworth, Frank Agnone, Jim Shea, Kendal Marcy, Mark Kalbfeld and Todd Cassetty, and executive producer was Kendal Marcy. Brad Paisley is a critically acclaimed singer, songwriter, guitarist and entertainer whose talents have earned him numerous awards, including three GRAMMYs, two American Music Awards, 14 Academy of Country Music Awards and 14 Country Music Association Awards (including Entertainer of the Year), among many others. He has been a proud member of the Grand Ole Opry since 2001. Paisley has written 21 of his 24 #1 hits including his most recent smash, “Today.” The song has resonated with fans around the globe with the music video garnering over 42 million views, so far. “Last Time For Everything” is his current single from his 11th studio album, LOVE AND WAR, which was released April 21. It is his 9th consecutive studio album to debut #1 on Billboard’s Top Country Albums chart. On April 28 LOVE AND WAR was released as country music’s first ever visual album for a limited time exclusively on Apple Music. Paisley’s 2017 Weekend Warrior World Tour kicks off on May 18 in Saratoga Springs, NY and will continue across the country and across the ocean with shows in Sweden and Norway this summer. Paisley has partnered with Boot Barn® and developed an exclusive line of jeans, hats, T-shirts, jewelry, belts and woven shirts called Moonshine Spirit by Brad Paisley. Connect with Brad at www.BradPaisley.com,www.Facebook.com/BradPaisley, on Twitter @BradPaisley, on Instagram @Brad Paisley, and YouTube at YouTube.com/BradPaisley.